It’s the end of an era on the Mesa, as longtime San Diego State men’s basketball head coach Steve Fisher plans to announce his retirement. An 18-year coach with the Aztecs, Fisher informed his players, fellow coaches and SDSU’s president Elliot Hirshman of his decision to retire on Monday, per Mark Ziegler of The San Diego Union-Tribune. Stepping into Fisher’s sizeable shoes, longtime assistant coach Brian Dutcher is expected to take the reigns from Fisher entering the 2018 season. Dutcher has worked beneath Fisher’s tutelage since 1989, as their partnership dates back to their ’89 title with the University of Michigan. The Aztecs’ current players are comfortable with Dutcher stepping into the limelight and believe he is the best option to take over such a successful program, per source. Prior to stepping onto the Mesa, Fisher signed arguably the best freshman class to ever touch the college hardwood with Michigan, the infamous Fab Five. He also reigned in three regional championships during his nine-year stint in Ann Arbor. Fisher then took his talents to SDSU, a decision that would fundamentally change the Aztecs’ men’s basketball program for the better. SDSU’s men’s basketball team had orchestrated 13 losing seasons in their last 14 seasons before Fisher took hold of the program in 1999. He then turned what was considered a losing program into a dominant one, notching four Mountain West Tournament championships (2006, 2010, 2011) and six MW regular season championships (2006, 2011, 2012, 2014, 2015, 2016). Looking forward, Dutcher will not have the smoothest road to success in San Diego, as there are many pressing areas of concern that must be addressed before the Aztecs get back to the winning tradition Fisher cemented in San Diego. The Aztecs are coming off a measly 19-14 season where they finished 9-9 in conference play and lost to Colorado State in the MW tournament. While it is true that Dutcher and the Aztecs have a lot to work on this offseason, this day will be spent honoring the best head coach SDSU has ever seen. Fisher leaves SDSU with an all-time record of 386-209 (.649), two Sweet 16 appearances, eight overall NCAA tournament appearances and four MW Coach of the Year honors. He was recognized as the Naismith college coach of the year in 2011 and earned the Wooden Legends of Coaching Award in 2015. A press conference is set for this Tuesday to formally announce his retirement and introduce Dutcher as the new head coach. After that, Fisher will ride off into the sunset of retirement. The San Diego State men’s basketball team has had its ups and downs this season. After being selected to win the Mountain West conference in the preseason, the Aztecs find themselves fighting for a sixth place finish in the conference alongside Fresno State. The record does not reflect the fight and passion Aztecs head coach Steve Fisher and his squad have put in, as most of the losses were by 10 points or less. The Scarlet and Black have an opportunity to avenge one of those losses as Air Force travels to Viejas arena for the final home game of the season on Thursday night. The last time these two teams squared off, Air Force walked away with a 60-57 nail-biting win, leaving the Aztecs with a frustrating trip home. There’s no doubt that this game will a lot of hype around it. It’s not only a revenge game and the last home game, but it’s also senior night in San Diego. Dakarai Allen, Matt Shrigley, D’Erryl Williams, and Valentine Izundu will all be honored pre-game in the starting lineup alongside Malik Pope. Allen, Shrigley and Williams started their SDSU careers during the 2013-14 campaign. Air Force comes into this game boasting an offense that averages nearly 75 points per game, while the Aztecs average just 69 points per game. The strong suit of this SDSU team has and always will be defense, thanks to the program and philosophy of coach Fisher. Beneath Fisher’s tutelage, SDSU has allowed just 63 points per game, a tremendous feat in Division I basketball. Keys to the game for SDSU will be defensive pressure, handling the ball, and keeping the foot on the gas in the second half. The Aztecs have averaged at least a 10-point lead in each of their conference losses this season, and it has been the primary concern among Scarlett and Black fans. Tipoff is at 7 p.m. at Viejas arena Thursday night. Coverage will be provided live via Twitter from @KCRsports. San Diego State men’s basketball fell just short of the mark, as Colorado State University battled back from a 13-point deficit in the second half to beat the Aztecs, 78-77. CSU senior guard Gian Clavell was the man responsible for the Rams’ game-winning shot, putting the game on ice with a layup with just 3.8 seconds left in the contest. The Aztecs’ student section wasn’t thankful of Clavell, as the Scarlet and Black faithful dialed their chanting efforts towards him all night. Unfortunately for The Show, their chants only seemed to fuel Clavell’s scoring frenzy. Clavell’s layup pushed his point total to a career-high 37 points on 14-23 shooting from the floor. The Aztecs, however, dominated the first half of Saturday’s affair with momentous dunks from both Pope and senior center Valentine Izundu. The two’s efforts helped SDSU build a 10-point lead at halftime. The Rams, of course, bucked back. A barrage of three-pointers fueled CSU’s comeback efforts, as the team shot an outstanding 87.5 percent (7-8) from downtown in the second half. With that, the Rams finished the day shooting 55.6 percent (10-18) from behind the arc, doubling the Aztecs’ measly 27.3 percent three-point percentage. Pope did his best to keep SDSU’s offense afloat, as he led the team in scoring with 19 points. He also picked up a team-high seven rebounds, filling the void of injured sophomore forward Zylan Cheathum. Cheathum was a late scratch from the lineup due to a “stress reaction” in his foot. His status will remain day to day. 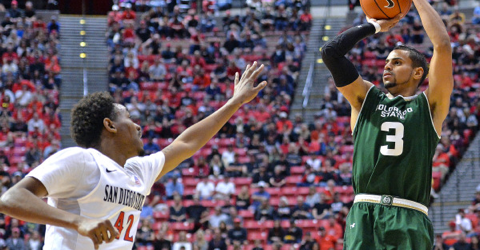 SDSU’s second half collapse against CSU shares similarities to the team’s 60-57 loss to Air Force on Tuesday. Both games featured an Aztec team incapable of maintaining a lead in the closing minutes. Though SDSU was able to crash the offensive boards late in the contest, they simply couldn’t push their shots through the bottom of the net in the clutch moments of the game. Additionally, the Aztecs’ offense left a lot of points off the board because of missed free throws, as the team shot just 67.8 percent (19-28) from the line. Pope went as far as to completely miss the basket on one of the team’s final free throws, one of many SDSU miscues late in the game. Despite the mistakes, SDSU head coach Steve Fisher believes his team did everything necessary to win the game. The loss adds to the Aztecs’ current downward spiral, as they have now fallen to 11-9 overall and 3-5 in conference play. Fisher will look to right the ship before the Aztecs’ next home affair against the University of Wyoming on Tuesday, Jan. 31.